As a family we are never happier than when out in the forest for the day, so I knew Forest Holidays would be the perfect break for us. 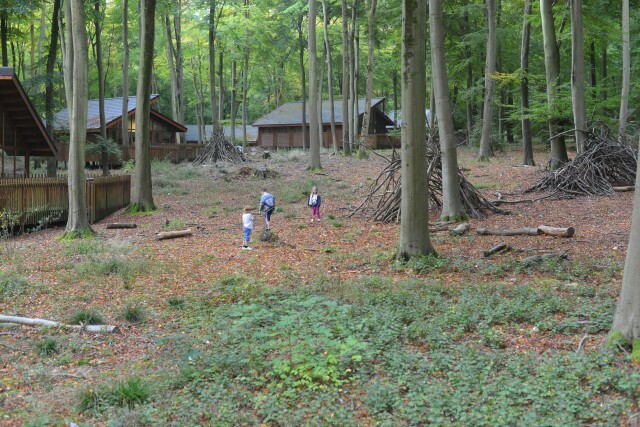 Forest Holidays in Blackwood Forest, Hampshire is a beautiful location set in 270 hectares of Beech Forest. There are 60 cabins onsite, but it doesn’t crowded as they are very spread out. This is the view from the decking of our cabin, you can see just how much space there was for the kids to safely run around. All three of them loved the freedom and it was fantastic for us to watch them make up games, build dens and generally have the most amazing adventures while we sat watching with a coffee! The hub of the forest is the Forest Retreat where we were greeted by very friendly cheerful staff and given keys and directions to our cabin. The Forest Retreat is home to a lovely cafe and bar which serves breakfast, lunch and dinner, you can even order food through the in cabin entertainment system and pre order breakfast and pizza packs. The little shop area is well stocked with essentials, we loved the fresh bread and pastries and had a lovely curry ready meal on our first night from the “COOK” range, which I’d definitely buy again. My little girls were desperate to try the pottery painting available, but we were just too busy exploring the forest. 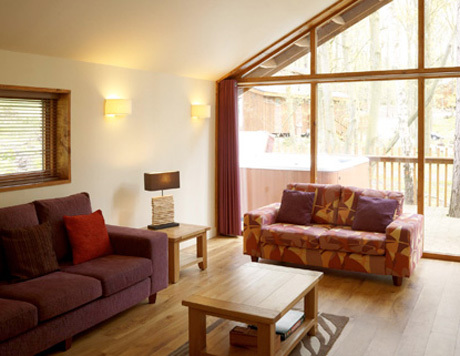 We stayed in a lovely Silver Birch cabin with three bedrooms, it was the perfect size for our family of five. The cabin felt very luxurious with floor to ceiling windows in the living/dining area and an extremely well equipped kitchen including a dishwasher and washing machine. 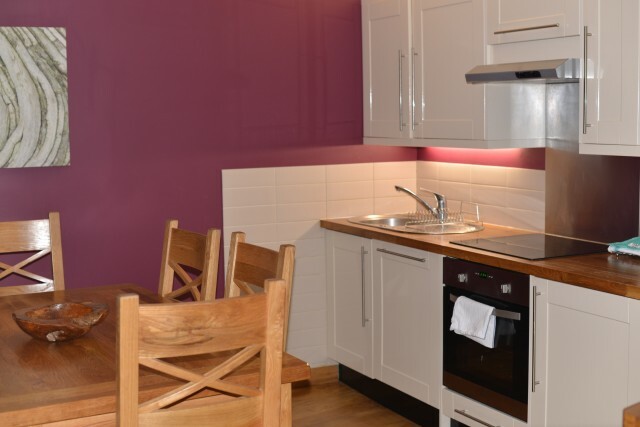 We didn’t need to take any kitchen items at all, although if you’re staying for more than a few nights you might want to take some washing up liquid and extra dishwasher tablets. We’d been given complimentary robes, slippers and towels which are not included as standard (they are included in Golden Oak cabins ) but I would recommend paying extra as it made a huge difference not having to pack five towels, especially as you need some for after the hot tub. I loved having a dressing gown for the evening and slippers were great for morning coffee and freshly baked croissants ( ordered from the Forest Retreat ) on the decking. The hot tub was a lovely luxury, we let the children try it for a short period of time, which they thought was the best thing ever! Then once they were safely in bed we sat in for a while in the evening too. It was such a treat to be sat in the hot water with a nice cold drink appreciating the peace and quiet around us. The easiest and fastest way to get around the forest is on bikes which are available to hire for £28 per break for an adult bike. We didn’t hire any this time, but if we go again would definitely consider it as it would’ve been nice to have covered more of the forest than we managed walking, although we did very much enjoy our walks. 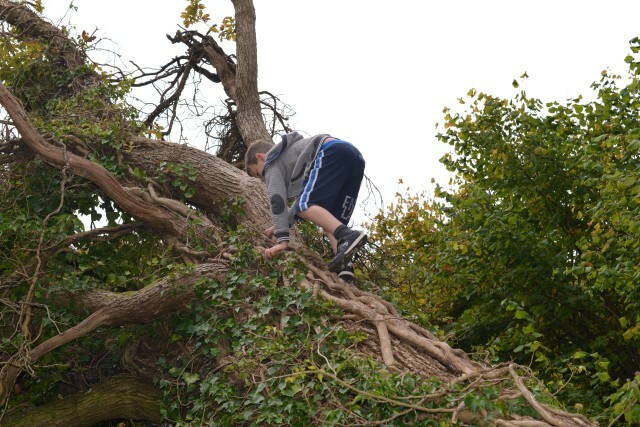 Zak is always happy when there is a tree to climb and a den to build. I loved that there were dens dotted all around the forest and some of them were completely amazing, the kids were in awe and very inspired to build their own even better version. There is a small playground area near the Forest Retreat perfect for little ones and handily located so you can see it from the decking of the Forest Retreat cafe meaning you can relax while the kids play. Next to the play ground is the most amazing bug hotel we’ve ever seen. I really want one in my garden! 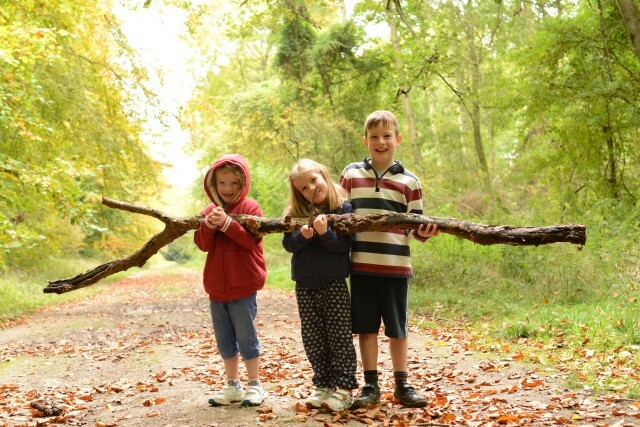 There are lots of trails around the forest with maps available from the Forest Retreat. 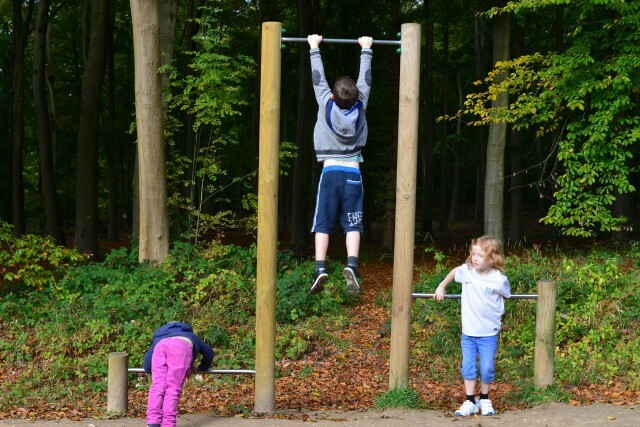 We especially loved the Trim Trail, a walk with exercise stations dotted around. The kids enthusiastically ran between stations, jumping, climbing and hanging. It was the perfect way to spend a Sunday morning. You can also book a variety of ranger led activities, including bush skills, twilight walks and even a night vision experience. Archery is also offered in peak season, but unfortunately not when we were there as Zak was desperate to try it, especially when he spotted the targets on one our our walks. All in all, we LOVED our magical weekend in the forest and would absolutely recommend Forest Holidays. We’re hoping to try one of the Scottish locations early next year and a weekend in one of the magical treehouses at Thorpe Forest is high up on my holiday wishlist. If you fancy a child free weekend, the gorgeous Golden Oak Hideaway Cabins look heavenly with beautiful furnishing, a hot tub, hammock and large sunken bath. Imagine relaxing evenings by the log burning stove after a long walk in the forest and a soak in the hot tub. Wouldn’t that be lovely? We were given a complimentary weekend stay at Forest Holidays. What an amazing place to stay, so much to explore and adventures to be had. I’m not sure that Roo would want to get too close to the Bug Hotel however I think Tigger would find it fascinating. That looks amazing! It looks really relaxing – I love a bit of peace, quiet and the great outdoors. I agree that towels take up a lot of space in the case, so I always appreciate having them included on holiday, and a dishwasher while self-catering is essential in my opinion! ooh how fab. I have been on a blogger night with them and loved the cabins. Just wish i’d had more time! Oh that just looks so perfect, I love the contrast of the outdoor activities and then relaxing in the hot tub, that is my kind of holiday. It looks like you had a wonderful stay! 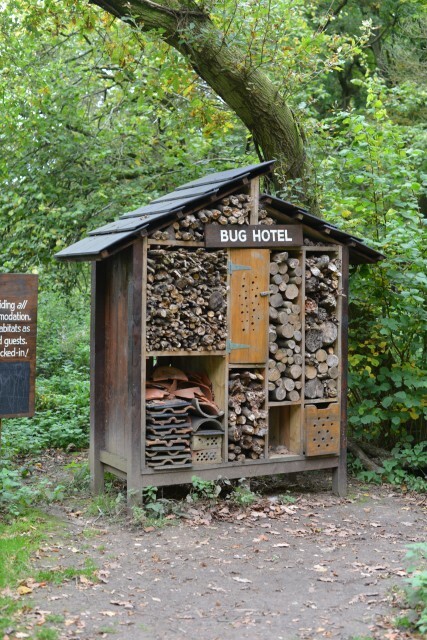 I keep meaning to make a bug hotel with the children, but it wouldn’t be as awesome as that one! The hot tub looks amazing, what a great way to relax. Cass@frugalfamily recently posted..Could you live without TV? I went on the same blogging event as Emma last week at their Forest of Dean site. I was really impressed. I loved the bathrobes too. Just wished I’d had a bit more time to explore. aww this is fab, we are massive fans of Forest Holidays. Kara recently posted..Crocs for all the family! This looks like an absolutely amazing holiday; I love that you feel as though you are quite remote but there are plenty of amenities to hand. The hot tub sounds divine as well! 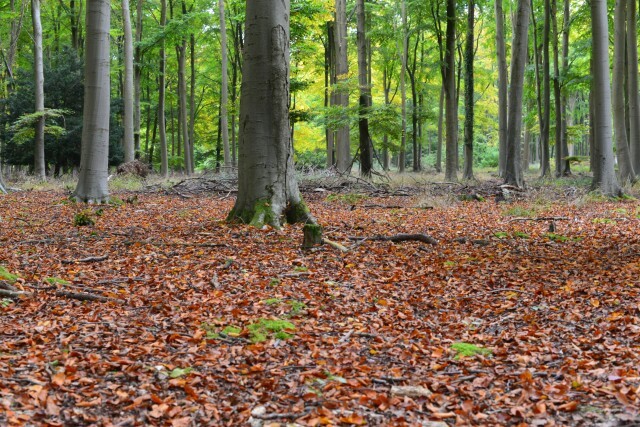 The in-laws have booked the whole family in to Forest Holidays Sherwood for their Golden Anniversary next year. I’m really excited about it – even more so after reading this review! What a great place to stay and I love the idea of night time hot tubs!